« Henry G Manson: Could Dave just be thinking of an early election? There’s a new Ipsos-MORI poll of voting intentions for the Scottish parliament and these show the same trends that we saw in the Scottish local elections on May 3rd. Scottish Labour moving up with the SNP moving down. A big loser since the last poll at the start of the year has been the Scottish Lib Dems. 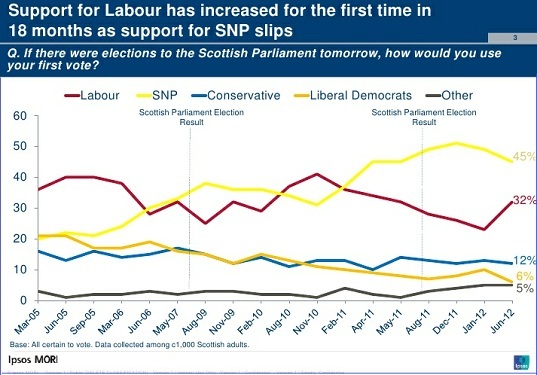 The shares, in common with MORI’s current practice are based on those certain to vote: SNP 45:LAB 32: CON 12: LD 6. The leader ratings have the new head of SLAB, Johann Lamont, moving up sharply a net 15% to a net positive of 9%. Salmond, meanwhile sees his net satisfaction drop from +22% to +13%. With both the NO and YES referendum campaigns now up and running it will be interesting to see how these affect the party and leader figures.